Sign the petition form below to ask the Tasmanian Parliament to ban all new climate-damaging projects in Tasmania, including all new fossil fuel projects and projects using native forest wood for biomass power generation. No new fossil fuel exploration or extraction. No new gas infrastructure. No extension of gas reticulation networks. Please sign this petition regardless of whether you live in Tasmania or not. Any new projects that affect climate will affect everyone in all parts of Australia, and indeed anywhere in the world. 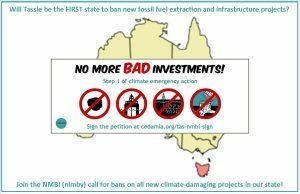 Can Tasmania become the first place in the world to ban all new fossil fuel extraction and infrastructure projects? Click to share the above image on Facebook. Click to share on Twitter. 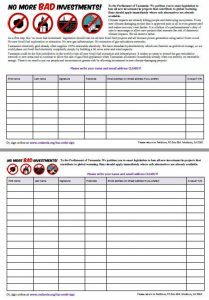 See the Tas NMBI Action Kit if you’d like to help build this campaign in Tasmania. 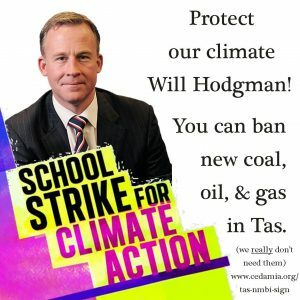 This petition to the Tasmanian state parliament focuses on just one component of the Climate Emergency Declaration and Mobilisation program called for in our petition to all levels of government in Australia. 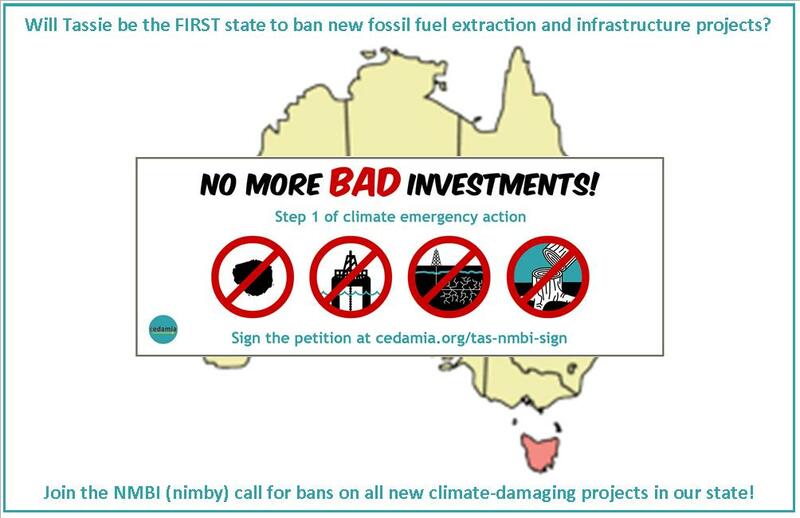 State governments have the power to ban specific types of projects within their own state, so successful campaigns to have state/territory governments ban climate-damaging projects would achieve one of the aims of the nation-wide climate emergency mobilisation campaign.